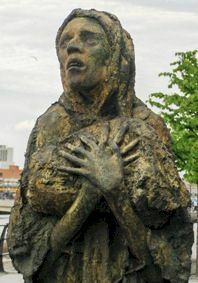 Ancestry.com has released the Famine Relief Commission Papers 1844-1847. This collection is not going to be a mainstream Irish genealogy resource but it will be of interest to anyone studying the Great Hunger and it could be useful to those whose ancestors held some form of official or local establishment position. It contains letters and other documents from members of local relief committees, lieutenants of counties, the clergy, and other citizens and touches on a broad spectrum of issues. Among these are reports of local food prices and relief efforts, requests for funds, lists of subscribers who had (or had failed) to donate to relief funds, queries about work projects or seed corn, names of committee members. More than 10,000 names appear in the collection and there is a free index, so it's worth checking out even if your ancestors are unlikely to have held an official post. The digitisation of the 1901 census of Ireland is on course for a mid-June release, according to Catriona Crowe, senior archivist of the National Archives. At a seminar at the National Library of Ireland today, she announced that the project would meet the deadline set late last year (30 June) but due to lack of staff resources, the records will be released without checks. This is disappointing because the handwriting and condition of the original 1901 census returns don't make for easy interpretation at the best of times. Still, for the majority of searches, it will probably be fine so I, for one, won't be complaining. I'd rather see an imperfect release of these records than no release. Also talking at the seminar was John Grenham whose book, Tracing your Irish Ancestors, is considered the 'bible' of Irish genealogy. He has been involved in the recent launch of the www.irishgenealogy.ie site which currently contains church records for Dublin and Kerry. He announced that the site would have County Carlow records added within the month, and those for South West Cork shortly after. And yes, all these records – both the 1901 Irish census and the church records – will be available online with completely free access.